Open Letter to the Mayor of Huron*, California. Mayor, you are doing some great stuff for Huron, keep it up. I rarely read the Fresno Bee, but I was in the hospital for surgery and a copy of the 24 Aug 2018 issue was left on my food tray. I have, over my now 77 years, developed a number of time tested and trusted sources for news and information. The Bee is not even in consideration - other than possibly for local events. As a former Mayor myself, (6th largest city in Los Angeles County at the time) I like to keep my fellow mayors backs covered. However, your statements, as quoted in the Bee, about the environment and causes and effects are largely unsubstantiated in actual raw data. I hope you will be able to extract yourself from the politically correct conspirators in the anti-fossil fuel movement, to consider real world ramifications of not having fossil fuel. I’ve reviewed your LinkedIn history and understand that you have been involved in the green movement for a considerable time. So, much of what I am stating in this post should be familiar to you. Perhaps not as “conveniently” stated as you are accustomed. First, apparently from the photo (see image 1) in the Fresno Bee (as noted the Bee is not exactly a bastion of accuracy, so who knows what was really in the photo) you have surrounded yourself with a large number of fellow carnivores (possible exception being the gentleman in the sports jacket). All others are observably heavy (pun intended) consumers of meat, cow’s milk, and eggs. Are you aware that the number one environmental issue (far and above all others) is water pollution? (Especially, ground water). And what is the greatest cause for the worldwide contamination of our water? YOU, and the other people in that picture!!!. Perhaps you know that over 67% of crops (1) in the U.S. are grown to feed animals - plus 20% of all fish caught are fed to animals (2). Just so humans can eat animals. The single greatest contributor to water pollution is animal waste not just excrement and urine (3) but the process of getting a living animal killed (or milked), butchered, packaged, and delivered to your table. In addition, over 45% of all animal greenhouse gas emissions are from producing and processing food to feed animals (2). That does not include the methane emitted by said animals (which may be worse than all the production and use effects of “fossil” fuels). “It takes about 100 calories of grain to produce just 12 calories of chicken or 3 calories worth of beef”(1). This does not include grazing land which is considerable (accounting for at least 60% of cattle’s life). “Animal protein production requires more than eight times as much fossil-fuel energy than production of plant protein..”(5). I get it you want to have-your bacon-and-eat-it-too. “Humans in America consume upwards of 3 times the daily recommended amount of protein”(5). Thus wasting water, livestock, and, you guessed it, fossil fuel. If you really believe in “environmental health” then your real focus should be getting people off SAD and onto a vegan (herbivore) diet. To simplify it: “The energy consumed (water, grain, et.al.) to produce one “quarter pounder” of beef would feed 3 people for an entire day”(6). So basically 3 children will starve for an entire day because you had a 1/4 pounder at Mickey Dees. Let’s continue. What about ethanol? After all, as most believe fossil fuel is just old plants (mixed with some animals) and ethanol is new plants (fertilized with animal stuff and of course petroleum (aka fossil fuel) from which is derived pesticides), does your campaign against “fossil” fuels include all plant based fuels? It is far more expensive (and more damaging to the environment) to produce ethanol than just about anything else. The cost to produce ethanol consumes more energy than the amount of ethanol produced. Adding to that cost, cars get less miles per gallon and wear out faster. Ethanol is similar to the cost/benefit (environmental/damage) ratio as is growing food to feed animals for humans to eat. By-the-way (BTW), there is a working “scientific” theory (yet to be proven otherwise) that “fossil” fuel is abiotic (8). In other words it is naturally produced from the earth’s magma core. A process that has been replicated in a laboratory. This would mean oil is not a depleting resource. I presume that Huron, like most communities in the world, has streets paved with asphalt, aka bitumen, aka orimulsion “-which became the ‘fourth fossil fuel’ in the mid-1980s”(9). [Orimulsion is, also,] the cost-effective choice when compared to other fossil fuels used to generate electricity.” Unless you have to haul it in from out of state. Speaking of diesel fumes, “Hot bitumen (asphalt paving) gives off emissions that can cause minor respiratory tract or eye irritation after prolonged, close exposure...”(10). On any paving day this pollutant alone is greater than the I-5 diesel trucks impact on Huron. That is another tough sell to Huron’s citizens and businesses to convert all the streets to concrete to avoid fossil fuel pollution. 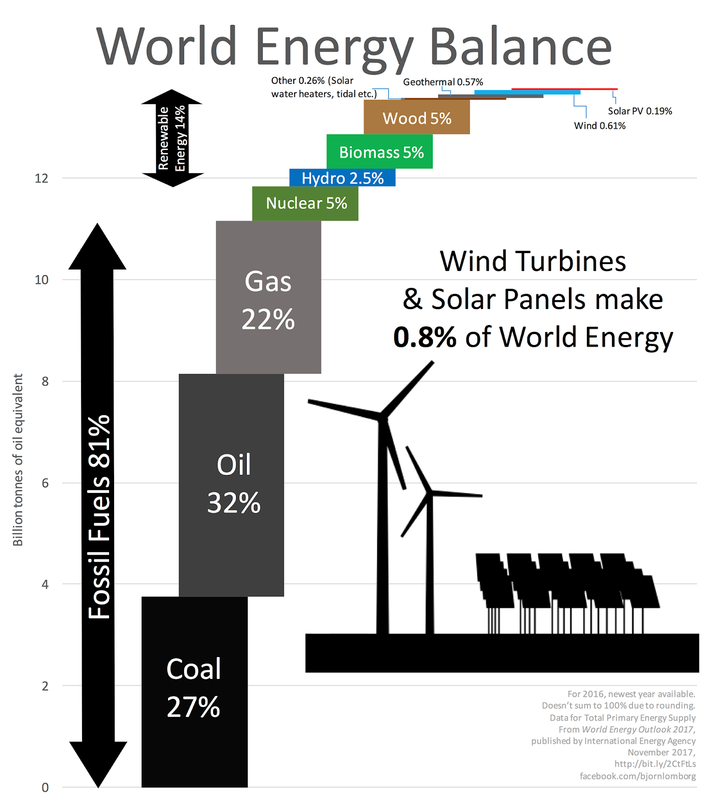 Wind Turbines and Solar Panels combined, makes up a whopping 0.8% (zero point eight percent, that is less than 1%) of World Energy (see image 2). What is perhaps most discouraging, renewables are not keeping even with increased energy demand. They are falling behind. In order to achieve 100% renewable energy California would have to rent the states of Nevada and Arizona and entirely cover them with solar panels and wind turbines. What happens when the wind stops and/or the sun goes down (aka nighttime)? Do you really want to have your lovely town depend on it’s survival based on whether or not the wind is blowing? In addition, non-fossil based energy would require massive structures for an energy collection system being placed in the ocean along our coastline. I will not even go into the wholesale death of bats and endangered animals from wind turbine and solar farms. So why don’t you put away all this silliness about stopping fossil fuel and simply advocate for something that would actually solve the problem -nuclear energy? Are you aware that in an independent study conducted in 2009, two-thirds (2/3, 67%) of NOAA’s earth based thermometers were miscalibrated? (12) One can only imagine the miscalibrated state of thermometers in the rest of the world. And yet they (you know who) claim worldwide accuracy within 1 degree Celsius over 50 years and shout that this is a settled trend. Do you know it’s a scientific fact that every single person who ate carrots prior to 1899 is dead. BTW, that is not science. But one could say death is associated with eating carrots. Historical climate fact, the volcanic eruption of Mount Tambora on the island of Sumbawa, Indonesia in 1815 is credited with causing the year 1816 to be known as the “year without a summer” in the United States (13). It led to unpredictable and devastating weather conditions worldwide, cholera outbreaks in India, crops destroyed in China, and in Europe, food supplies dwindled, leading to starvation and panic. One single event via mother nature. So much for anthropologic global warming (AGW). Do you have even a single source to justify this statement? The amount of diesel truck emissions, as trucks travel passed Huron nearly 5 miles away, pales in comparison to the agricultural emission spewed into your city by the farms between I-5 and Huron proper. I believe agriculture is Huron’s single biggest revenue generator and jobs producer. This may well be true, but what is the ongoing source of “contamination”? I’m sure you know. It’s called food production. And it was even worse before we had cars. “Central Valley pollution is largely particulate matter, from pollen, fertilizing, and harvesting crops...”(14 & 15). Which, and yes of course, includes the fossil fuel needed to do such. And the fact that we live in a basin with the tallest mountains in the country on one side. “Food production accounts for more than 51% of all the pollution in the entire state”(15); which is far more concentrated in the Central Valley. I literally don’t know where to begin with such a ______ statement. First, back to you. An average carnivore (omnivore, if you have some vegetables with your meat, milk, and eggs) wastes at least 1,500 gallons of water a day (eating 3 meat meals a day wastes as much as 4,000 gallons a day) over and above that of a vegetarian (aka herbivore at 300 gallons per day) (16). That is between 45,000 and 120,000 gallons of wasted water every single month by each and every person eating an animal based diet (aka SAD). Second, the “drought” in California was a politically motivated and managed effort by the same kind of people who want to stop issuing permits for fossil fuel in the State. That’s right you are part of your own problem. Yes, there was a natural lessening of rain due to cooling conditions in the Pacific ocean, but there was never a “shortage” of available water for Huron or any other agricultural need. Shortages were faked by those who’s interests are to destroy farmers in the Central Valley. You of all people should know the “drought” was contrived, -I realize this happened before you were Mayor. Third, you do know that cooling water and air are what cause less rain/water to be distilled/evaporated from the oceans (18), which is what causes natural drought shortages? So called “global warming” would dramatically increase the rain delivered to the mountains and valleys, especially in the Central Valley. Further more, if warming were happening the snow melt would have increased. To prove this, just put a pot of water on your stove and see how much evaporates while the burner is turned off. Then, try it with the burner turned on. Duh. As to CO2 causing warming, stick a straw (please don’t use a plastic straw) in the water and blow your lungs out (that’s CO2 BTW) you will not warm that pot of water a single degree. You will not carbonate the water either. First, what has wildfire pollution got to do with fossil fuels? 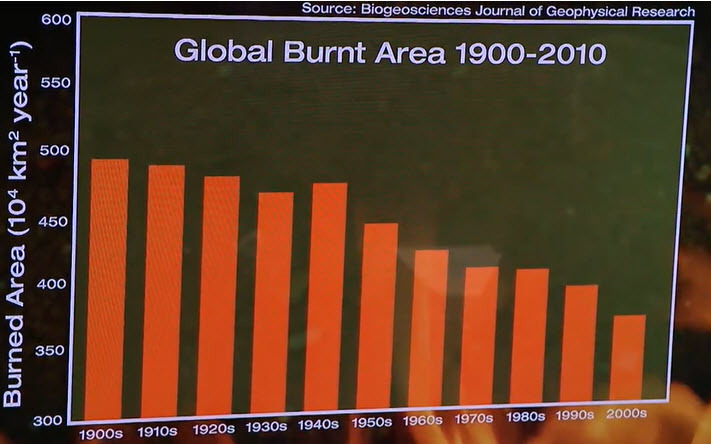 Second, are you aware that “wildfires” in the U.S. have declined steadily over the last 6 decades to the point they are nearly half of what they were in the 1940s and 1950s. This is worldwide as well (see chart 3) (19). BTW, 95% of wildfires are started by humans. 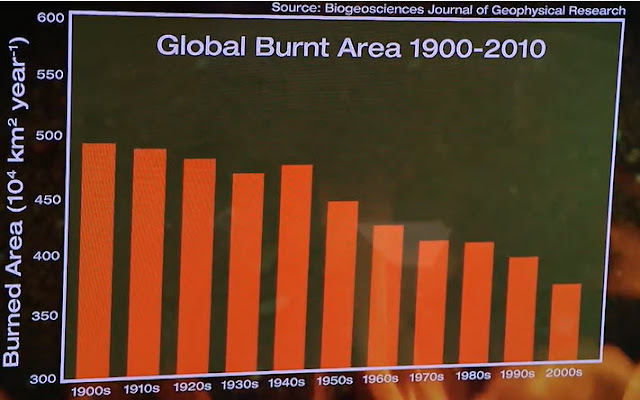 Fewer people fewer fires, right? Oh, wait our population has more than doubled while fires have been cut in half. You’re right it has to be global warming, NOT. Third, the problem we have in California is, once again, our “tree-huggers” have dominated politics so we have not properly managed our forests. The forests in California are a disgrace from both disease and fire intense ground foliage. Had lumber companies been allowed to harvest and manage, we could have avoided much of the “pollution” being spewed today. Mayor: “... stop issuing permits for fossil fuels” Why? What is your endorsed alternative? The only result from not being energy self-sufficient in California is, it will cost more to feed our families, grow our crops, and travel; and will reduce our ability to compete in the world market for exports. Without its own fossil fuel resources, California would have to import energy from other states and countries, making us vulnerable to their whims and conditions. All of this is especially bad news for Huron. There is near zero benefit for what you are advocating, other than aesthetics. I challenge you to produce any credible evidence to the contrary. The goal of your friends at “stop permits for fossil fuel” and others is to make everything so expensive that no one will be able to afford to have any children, thereby not just slowing the population growth; but reversing the earth’s population from 7.5 billion to somewhere in the 5 billion range (or less) (20). Just ask them, what is the goal for the ideal population for planet earth? Reminds me of the story of the man riding the train to work and everyday he would ask the conductor the time; believing that railroad time was always accurate. Finally one day the conductor asked, why the man asked the time every day. The man said he was responsible for setting the time on the clock in the town tower. Whereby the conductor informed him that he set his watch by the time on the town tower clock. Are you aware of Methane Hydrate? (22) There are sufficient quantities of methane hydrate on earth to support the current rate of carbon based power consumption and growth for in excess of 1,000 years. That’s just scratching the surface (literally) the real amount is yet to be discovered because there has not yet been a method developed to explore for it beneath the surface. “...locations of seeps are consistent and predictable...” we know where they are but are prohibited from relieving them because of idiotic governmental rules and people like yourself. Drilling off the California coast where these seeps have been located, would relieve the pressure and eliminate these continuously occurring natural disasters. Since we know where this oil is, there is no need for test drilling, and because of their close proximity to the shore, the cost to extract and deliver is drastically reduced; and the environmental safety is outstanding. Is relieving these seeps part of the plan at “stop issuing fossil fuel permits”? Or do they just not care that our beaches are continually being polluted? If you choose to fact check be sure to use multiple sources; a typical left wing source is “Snopes” and often they will slant and disparage opposition. The Bee is notorious for erroneous information so if you didn’t say what was quoted, so be it. However, even Google with its demonstrated liberal leaning bias will cough up fact after fact that what I’m telling you is accurate. The harder problem is removing oneself from the “echo chamber” of those who do not know what they are talking about, aka “science deniers” or more accurately “solar deniers.” The sun being the real cause of warming and/or cooling (18). Did you know that in some places the temperature drops as much as 50 degrees after the sun goes down? If you really truly believe in “fixing” the environment, the single greatest impact with virtually no government intervention – just choose to not eat meat, milk, or eggs. This would be a far, far greater benefit to mankind than all the anti-fossil fuel initiatives combined. Other than wanting to be politically correct (PC, aka “saying whatever is popular”), or feel good; –If you eat meat, drink cow’s milk, consume chicken eggs you cannot lay (pun not intended) claim to being concerned about the environment. It’s a lie, hypocrisy , or ignorance – your choice. You cannot pretend to care about environment or climate change and be an omnivore. Outside of these two things anyone who professes otherwise is a liar, hypocrite, or just plain ignorant – your choice. Just wanted you to know I’ve got your back. So if you have anything else to say on the environment feel free to check-in with me. *Huron, California is located in central California in Fresno County it is a city of 1.6 square miles and a population as of the 2010 census was 6,754, up from 6,306 at the 2000 census. BTW/FYI, http://cityofhuron.com/ is not working. I had to go to https://en.wikipedia.org/wiki/Huron,_California to get info on Huron. 3. Pig Excrement Spills Into North Carolina Floodwater, Bloomberg, 18 Sep 2018. NC has 3,300 lagoons ... blamed for polluting groundwater... Hog waste contains E. coli ... dangerous levels of E. coli in water even after floods receded. 10,000 hogs and 1.7 million chickens died... North Carolina is home to more swine than any state besides Iowa -- 9 million of them, more hogs than New York City has humans. ...reared on contract for companies including Smithfield Foods Inc., the world’s biggest pork processor, which is owned by Hong Kong’s WH Group Ltd.
6. “The energy consumed (water, grain, et.al.) to produce one “quarter pounder” of beef would feed 3 people for an entire day.” “The demand for meat,” he says, “has a multiplier effect of 10. You need 10 times as much land, 10 times as much [feed], 10 times as much water to produce one calorie of meat as you do to have one calorie of vegetables or grain.” on J. Morris Hicks website at www.hpjmh.com WSJ on 9-3-2011, the CEO of the world’s largest food company (Nestle was quoted) Mr. Peter Brabeck-Letmathe. "Abusing our precious croplands to grow corn for an energy-inefficient process that yields low-grade automobile fuel amounts to unsustainable, subsidized food burning,"
8. There is an alternative theory about the formation of oil and gas deposits that could change estimates of potential future oil reserves. According to this theory, oil is not a fossil fuel at all, but was formed deep in the Earth’s crust from inorganic materials. 9. Orimulsion became the “fourth fossil fuel” in the mid-1980s. It is derived from the bitumen that occurs naturally in large reserves in the Orinoco oil belt in Venezuela. It is estimated that there are more than 1.2 trillion barrels of bitumen available in reserves, an amount greater than 50 percent of the world's estimated oil reserves. Bitumen aka asphalt (in US) aka bitumen of Judea, or Syrian asphalt, is a naturally occurring asphalt that has been put to many uses since ancient times. 10. Hot bitumen (e.g., asphalt paving) gives off emissions that can cause minor respiratory tract or eye irritation after prolonged, close exposure. 12. “Watts and his fellow researchers found only 410 “unperturbed” weather stations out of the 1,218 stations used by NOAA to determine U.S. climate trends.” An independent study conducted in 2009, two-thirds (2/3, 67%) of NOAA’s earth based thermometers were miscalibrated? 13. 1815 eruption of Mount Tambora, In summer 1816, countries in the Northern Hemisphere suffered extreme weather conditions, dubbed the "Year Without a Summer". Average global temperatures decreased by about 0.4 to 0.7 °C (0.7 to 1.3 °F), enough to cause significant agricultural problems around the globe. On 4 June 1816, frosts were reported in the upper elevations of New Hampshire, Maine, Vermont, and northern New York. On 6 June 1816, snow fell in Albany, New York, and Dennysville, Maine. Such conditions occurred for at least three months and ruined most agricultural crops in North America. 15. But farmland in the Golden State emits about the same amount of certain pollution-forming gases as on-road vehicles, a new study shows. That’s much more than researchers had previously estimated, bumping up estimates of the total production of these gases in the state by as much as 51 percent.